This month, on October 5th, is World Teacher’s Day and we are recognising the efforts of all the teachers who work with us to improve education. Good teaching matters everywhere. The dedicated efforts of teachers in our local partner schools and teachers from the UK who volunteer their time with our projects prove that a great teacher can make all the difference to a child’s education. We have asked a few of these teachers to share with you their daily experiences, joys and struggles and give you a glimpse into their world. We start by visiting teachers in Laikipia North in Kenya. When AET first met Mwenda he was a casual labourer who did small projects around the local school. However, our field coordinator saw huge potential in him and asked him if he was interested in training to be a local language teaching assistant. He has now worked as a teaching assistant for the last 3 years. 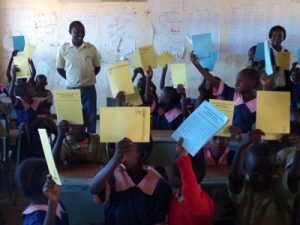 Mwenda took to teaching seriously and discovered he enjoyed it. His students got some of the top grades. Mwenda was encouraged to enrol for a teaching degree at the University of Nairobi and is currently in his second year. AET celebrates Mwenda for his achievements and his passion for transforming the lives of children at Kiwanja Ndege primary school where he continues to give his time as a teaching assistant. He is also gifted with two children, a girl and a boy. Michael is 27 years old and a grade two teacher from Olkinyei Primary school. He lives on the Makurian group ranch in the Laikipia Northern District. Many local families live on these group ranches, where nomadic communities live in traditional ways but also work to protect local wildlife. Michael has held a passion for teaching since he was a young boy. He had a large family, with nine brothers and sisters. He says his family had a real dedication to education. Michael himself is married and has his first child. He has been a teacher for 5 years. What subjects are you involved in teaching? “I teach maths, Maa, English, Kiswahili, Social Studies, Christian Religious Education and Science. Right now, in Maths we are introducing types of numbers; in English, we are doing comprehension and composition; in Kiswahili and in Maa we are looking at local stories; in science, we are studying energy; in social sciences we are talking about the proper use of resources and in Christian religious education, we are reviewing the qualities of a good leader. “I teach seven subjects. These are English, Kiswahili, maths, science, social studies, CRE and Maa in grade 2. Right now, in Maa, we are revising our sounds and phonics. In English, we are learning vocabulary about transport. In Kiswahili, I have been reading allowed stories. In Maths, we are doing multiplication and repeated addition. In Science, we are looking at plants. In Christian Religious Education, we are reading bible books and in social science, we are looking at children’s rights. Tell us what a typical day is like for you as a teacher? 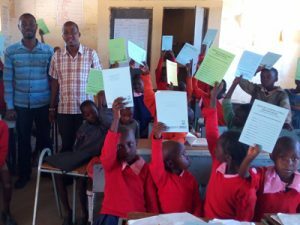 Mwenda Legei and Mr Kiloku are both involved in our early years’ education programme in Laikipia North in Kenya. The Maasai community in this region has very low attendance and completion of school. We have worked with teachers in local primary schools to incorporate Maasai language, stories and culture into education. They have worked hard and volunteered many hours to attend training, make their own teaching materials and improve the learning of their students.